Picture a big, fat, pouty face. Add blue eyes and glasses. Sprinkle on some freckles, as though someone is sprinkling paprika on deviled-eggs. There! You are getting a pretty good visual of the writer of this blog. Propane distributors have been hit hard by a double-punch of unfavorable weather. In the fall, farmers used more propane than normal to dry their crops after a particularly wet harvest. The recent cold snap also has taxed distributors. Well, guess what this farm-girl is relying upon for her heat!? We have an electric air-source heat pump, but it can not provide our heat when it gets this cold. It kicks over to auxiliary heat (propane) during cold spells. In this case … the cold spell has been about, oh, all winter! I remembered to check the propane tank’s gauge this morning during chores to see how we were doing. 10% in the tank! Good frozen icicles! I got on the horn and called our supplier. They will bring out a delivery of 100 gallons. I do not know how long that will carry us. So, I’m in conservation-mode. I turned the thermostat to a balmy 65 degrees. Luckily, our water heater is electric, so I don’t have to ration showers. My oven is electric, but the stove-top is propane. Therefore, I am making supper in the slow-cooker. 15-bean soup…with pig-farmer in the house. Good heavens, what am I thinking!? I truly meant to make it on a day he was working outside! Desperate times call for desperate measures. I briefly considered warming up by getting on the treadmill … but then I thought I wouldn’t want any perspiration to freeze on my forehead. So instead, I made brownies. Remember? Electric oven. Besides, that warms the kitchen, too! Multi-tasking. Thankfully, we do not have any pigs in the farrowing house, which we heat with propane. If Bernice is indeed pregnant, she will be due in April. This entry was posted in Country Living, Exercise and Motivation and tagged 15 Bean Soup, country living, Country photos, farrowing, Illinois, Illinois winter, pigs, propane, Propane shortage, sunrise. Bookmark the permalink. Absolutely gorgeous sunrise. I’m all for you personally investigating Hawaiian sunsets but who would feed all the critters and look after Pig Farmer? Indiana has been having a really bad winter, too. A gal who runs our seed exchange lives there and it seems to me the schools have been closed for most of the last 2 weeks. Now then, dahlink, I live in Florida and I can ASSURE you that we don’t consider 65 degrees to be balmy. You gotta get into the 70’s to be considered balmy. 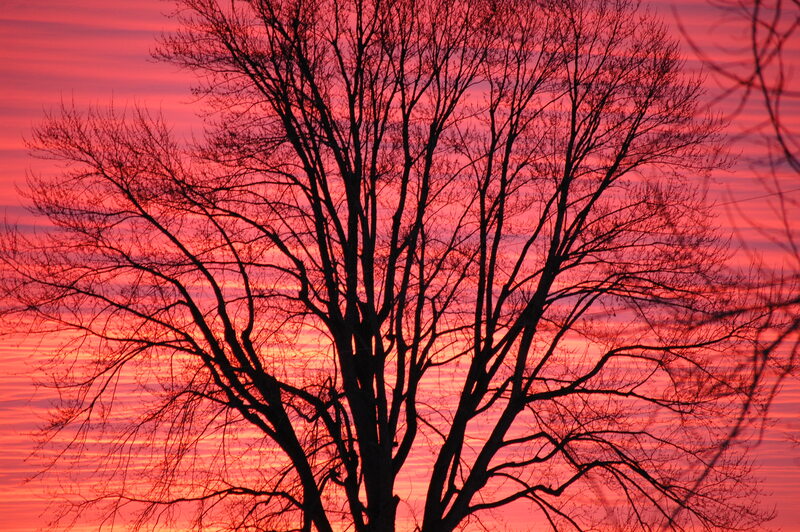 Red sunset at night, sailors delight, red sunset in morning sailor take warning. Oh, dear, you NEED a wood burning stove…heat and cooking all in one. Of course you have to have wood, which is a huge job in and of itself. Marla would you like some farm fresh pinto beans? I have some from this year’s harvest I would be delighted in sending you. Remember that they are pinto beans…some people don’t like pintos. That would be great! I love pintos. In fact, I just used them in ham and beans on Monday. Store-bought, tho. That is a beautiful sunrise warning about the snow and cold I’m sure. Hubby and I have had many discussions about how we want to heat our homestead. Had another one this evening. I really would like a wood stove and now he’s suggesting geo-thermal with wood back-up. I’m voting wood with electric back-up. Either way, we’re not voting propane, but I never considered the fact there could be a propone shortage. 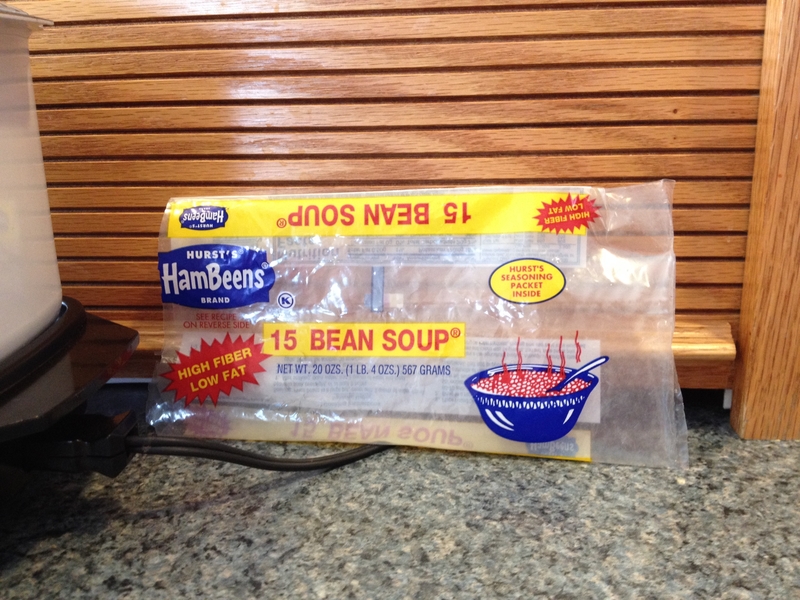 15 Bean Soup is a favorite in our house too, although I don’t follow the recipe on the bag. We just like the combination of all those beans. I would love a wood stove (I think, anyway). Stay warm, too! Hi Marla, love your blog, found you a couple months ago and enjoy checking in on you. I’m up in northern North Dakota. Just heard on the news tonight that Grand Forks has had it’s 10th coldest and 3rd snowiest winter on record. It was -26 this morning. We are having the same short edges of propane here also. Our main heat is electric and our backup is natural gas, love the natural gas, it is such a warm heat compared to electric. I’m getting tired of fighting the snow drifts and blowing snow here when doing chores or driving, it will make spring all the more wonderful, that’s for sure. Stay warm and take care. Linda B. So good to hear from you, Linda! I wish we had access to natural gas. It is cheaper too, I think? It is interesting that you are from North Dakota. My husband doesn’t mind winter … and he always says that he could live in North Dakota! I had tolerated winter very well (for me) until this latest cold snap … then, something froze and burst in me! I see had is the operative word. I agree. I am way over it. About 3 weeks ago over it. I saw a sunset that color not too long ago, but never a sunrise…but then, I don’t catch many of those. Period. Love that cute face in your header photo. Thank you! I wish the background behind the smiling kid was prettier … but, that “smile” is perfect!